A bride steps off a plane in London, ready to meet her fiance for the first time. 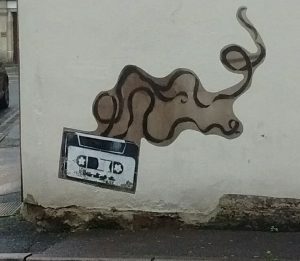 But things aren’t as they seem… I read this at Stroud Short Stories’ May 2018 event, where it was described as “riveting” and got lots of laughs. Here’s the video from the night. This story has also been longlisted for the To Hull and Back humorous short story competition. Written on my bus commute about a busy grandmother getting to know her grandson, this won the 2017 Gloucestershire Writers Network Prize. I joined other commended and winning authors and poets to read our work at Cheltenham Literature Festival. All stories and poems available in pamphlet form through the GWN. 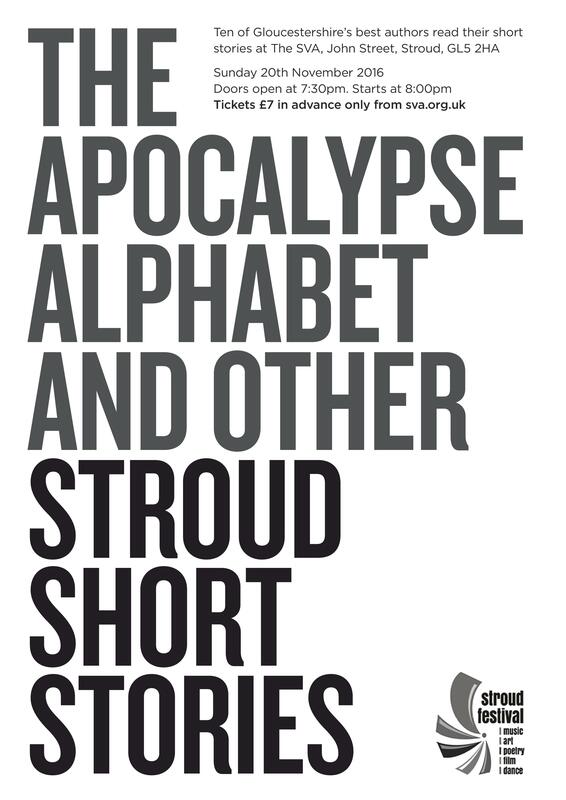 A short tale of a mum, a boy, and the end of the world, described by the judges as “clever, thoughtful, poignant, and impeccably drafted.” I read this aloud for the Stroud Short Stories event in November 2016, which borrowed the title from my story. Watch the video of my reading, and check out the other fantastic writers from the night, too! 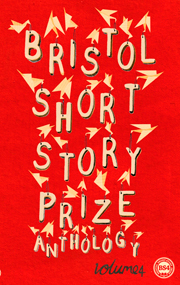 Published in the Bristol Short Story Prize Anthology: Volume 4, it tells the story of an unlikely romance struggling on against the odds. 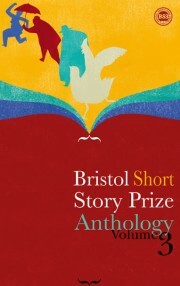 The anthology is available from the Bristol Short Story Prize shop, on Amazon, and from other good booksellers. Reviewer Rob, of RobAroundBooks, reviewed Cats and Elephants and called it “intimate and much more potent than its short length should allow it to be.” Read his full review and check out his blog here. About a brave Haitian girl’s experience during the earthquake of 2010, this story appeared in the Bristol Short Story Prize Anthology, Volume 3. 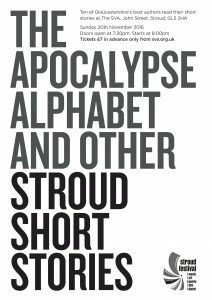 It, too, is available from the Bristol Short Story Prize shop, on Amazon , and from other good booksellers. Henbury School’s Gifted and Talented artists selected “The Meek Inherit” as a source for their art exhibit at the Arnolfini Gallery during Bristol’s ShortStoryville festival in 2011. Their incredible work is preserved online on their Flickr page. 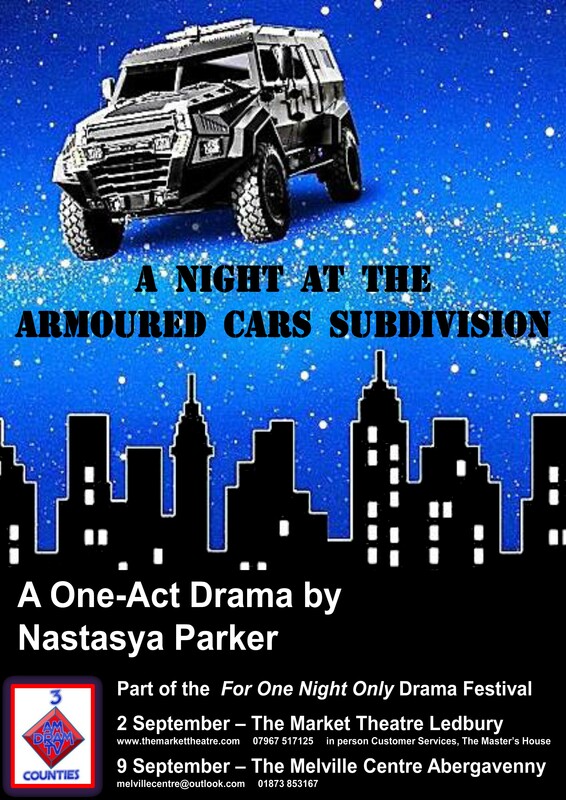 My first one-act play, A Night at the Armoured Cars Sub-Division, was selected to be part of the 3 Counties Am Dram TV 2016 mini-fest in Ledbury and in Abergavenny. In this short blend of political thriller and science fiction, some scientists tap into people’s subconscious, and solve crime by spying on dreams–but at what cost? 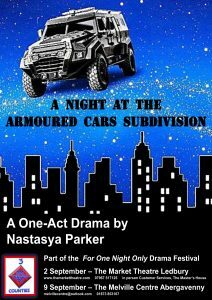 You can view a clip from the beginning of the play on YouTube, filmed during opening night. Eve finally tells her side of the story in my work-in-progress. What happened after leaving Eden, how did it feel to raise generations that would never know paradise on earth, and why did she take that fruit in the first place? The first page has already been longlisted in Words with JAM’s competition. Blog posts about my creation process start here. Currently under consideration with agents and competitions, The Wrong Ten Seconds follows Charlie, a hard-working older man who commits a single, frustrated act. Lonely teen artist Phoebe records this on her mobile phone, and her video goes viral, forcing Charlie to pay heavily for his misdeed, as Phoebe struggles with her own role in his undoing. My first novel was longlisted for Mslexia’s novel competition. Artefacts explores the far-reaching effects of our insecurities. A teaching assistant and an English teacher confront their own hopes, regrets, and religious differences while trying to help an antisocial seventh grader.